06.19.10: Parking area marker, great - I know, right! 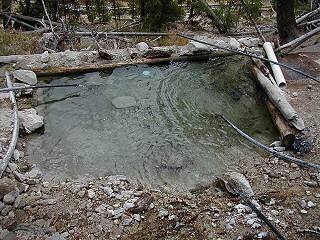 A log dam and rock bordered pool with a sandy bottom often laden with silt and algae. 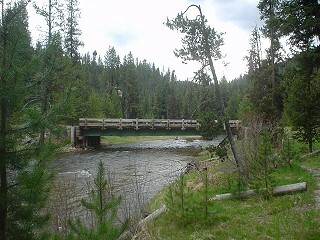 Located .25mi from the dirt forest road; both the trail and South Fork of the Salmon River are visible from the pool. Accessible all year - dirt forest is not plowed during winter; access on horseback or snowshoe. 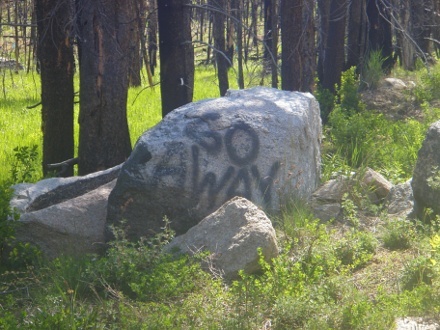 There is plenty of Boise National Forest camping nearby - no camping at the springs. Had to make some hose adjustments, but after about an hour of work and waiting I was able to get the temperature and flow just right for a soak. I made the hike up to the sources and was able to survey the situation from above. There wasn't much trash to pick up and didn't have any visitors either. I did notice that the hoses had been adjusted between the times I soaked; must have just missed someone else. The chiggers nibbled at first, but eventually ate me alive!! Chiggers are either Red Spider Mites on steroids, or are some mutant variant that are no fun to deal with. I really liked my soak at Molly's after hiking up to Tule Lake and back, but the chiggers will definitely get me to think twice next time I'm in the area. 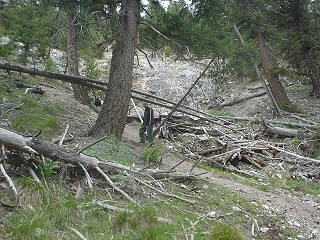 The forest in this area was hit hard by a wildfire recently. Despite the black trees, Molly's lives on with a newly reconstructed pool, complete with valves for hot and hotter. Sadly, the absence of a cold water intake prohibited soaking thanks to 115º pool temps. pH came in around 6+. Also worth noting, one of the lodges on nearby Warm Lake converted to a biker bar. As such, there was an abnormal amount of motorbikes ripping through curvaceous forest roads. Enough to bring out the fuzz, which I've never seen out here once in the last decade. It's bad enough already with folks and their big rigs on these tiny streets, please be careful regardless of your mode of transport. Red Spider Mite Activity Reported! We were stoked to have Molly to ourselves after passing the jam-packed tubs just up the road. No trash! Woo Hoo! 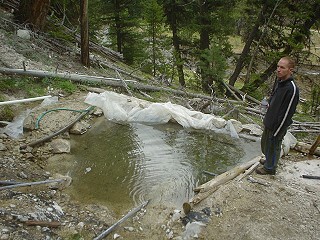 Great work everyone; keep picking up trash and utilizing low-impact techniques as this hot spring is in a very sensitive area. The pool was back to its original size, and finding the right mix of hot water to come out of the right hose proved to be quite difficult. After more hose fidgeting we were able to warm up the pool enough for a quick soak. Had we more time I believe we could have engineered a better setup. All in all, a nice trip. Very nice. The size of the single pool has increased along with overall depth, and to top it off the temperature was a perfect 102º. 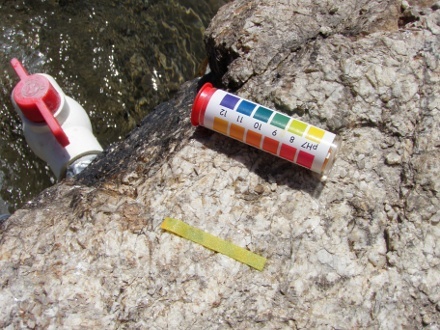 Some careful engineering of the hot and warm water flows have enabled the soaker more control of their ideal soaking temperature. 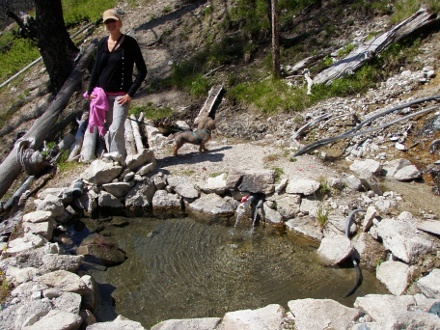 Despite it being hunting season we didn't see anyone else at this hot springs. Molly's Hot Spring was a pleasant surprise and an excellent soak. 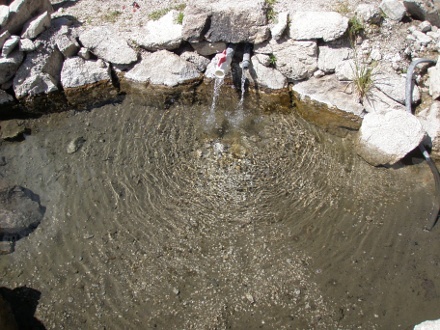 There are excellent camping spots near but not next to the hot springs, along with additional hot springs in a mere .5 mi radius. It has recently come to my attention that the pool at Molly's has been improved since my last visit. Apparently, it is much easier to control the temperature of the pool and the pool is deeper. I can't wait to get out there and verify this! Molly's was a bit cool on the day we visited. Another couple who were there before us had turned the hot water on so to speak, but the pool would still need another day or so to warm completely. No trash... my only beef was that the guy who was already there was not treading lightly. We noticed 5 vehicles with California plates this trip, plus the couple at Molly's HS were also from CA. We did not see or run into any non-Californians besides the lady with all of her kids at Vulcan HS. No vehicles were present in the pullout despite heavy amounts of recreation users.